The WBDG Whole Building Design Guide® has updated the Accessible Design Objective, added a new Resource Page on building information modeling (BIM): Life-Cycle Data Handoff: Guidelines for BIM Project Managers and posted a new Case Study: Renwick Gallery of the Smithsonian American Art Museum. Abstracts Wanted for Symposium on Building Science, Physics of Building Enclosure Performance	Abstracts are due September 29 to present papers at the ASTM International Symposium on Building Science and the Physics of Building Enclosure Performance, October 21, 2018, in Washington, D.C. Co-sponsored by ASTM International’s Committee on Performance of Buildings (E06) and Committee on Roofing and Waterproofing (D08), the symposium will provide a forum for the exchange of ideas on current research regarding building science and the physics of building enclosure performance. Get more information. The American Architectural Manufacturers Association (AAMA) recently released a white paper created by its Aluminum Material Council that discusses the use of aluminum in high-performing building enclosures. AMC-2-26, "Aluminum in High-Performing Building Enclosures," is now available in the AAMA online store as a complimentary download. Established by the U.S. Congress in 1974, the National Institute of Building Sciences has, from its beginnings, served as an authoritative source of information on building science and technology. More than four decades since its founding, this non-profit, non-governmental organization still brings the public and private sectors together to find solutions to make buildings better, safer, more economical places to live, work, play and learn. The Institute offered a number of actions that the Trump Administration; federal agencies; state and local governments; and the building industry can take to achieve safer, high-performance buildings and communities that will save the government, businesses, building owners and families money in the long term. Download the Recommendations. For a third year in a row, the International Code Council (ICC) has renewed its commitment to serve as the Conference Sponsor for Building Innovation 2018: The National Institute of Building Sciences Sixth Annual Conference and Expo. To be held January 8-11, 2018, at the Mandarin Oriental in Washington, D.C., Building Innovation 2018 will unite representatives from across the industry to discuss strategies and seek solutions to Sustain, Strengthen, Secure. As top sponsor, ICC will be featured throughout the Conference venue and on the Exhibit Hall floor. There are many other opportunities for sponsorships and exhibit spaces during Building Innovation 2018. Companies interested in showing their support for the Institute and the building community can reserve a sponsorship, exhibitor space and advertisement online. Find out more. The National Institute of Building Sciences Board Nominations Committee is currently seeking candidates to serve on the Institute’s Board of Directors. The Institute Board is comprised of 21 members. Six members are appointed by the President of the United States, with the advice and consent of the Senate, to represent the public interest. The remaining 15 members are elected and can represent either public interest or industry voices. The Board representation includes architects, builders, building owners, building standards developers, consumers, contractors, educators, fire safety professionals, local agency officials, product manufacturers, professional engineers, state agency officials and others. However, the majority of board members are required to come from the public interest category. The three-year terms begin in January 2018. Nominations can be submitted for one or more candidates, but a separate nomination form must be completed for each. In preparing the election ballot, the Board Nominations Committee will give equal consideration to all submissions, whether single or multiple nominations are received. Although membership in the Institute is not a requirement for nomination or election, it is encouraged. Nominations must be received no later than 5:00 p.m. ET, Friday, July 14. Download the nomination form. The National Institute of Building Sciences Awards Committee is currently accepting nominations for the 2017 Institute Honor and Member Awards. Each year, the Institute recognizes individuals or organizations that have made an exceptional contribution to the nation and the building community. Members of the building community will honor the recipients of this year’s awards during the 2018 Annual Awards Banquet, which will take place as part of Building Innovation 2018: The National Institute of Building Sciences Conference and Expo, to be held January 8-11, 2018, in Washington, D.C. Nominations must be received no later than 5:00 p.m. ET, Friday, July 14. Download the nomination forms: Member Award or Honor Award. With planning underway for Building Innovation 2018: The National Institute of Building Sciences Sixth Annual Conference and Expo, the Institute welcomes the International Association of Plumbing and Mechanical Officials (IAPMO) as the returning Technical Programs Sponsor. This is the third straight year that IAPMO has taken the role. 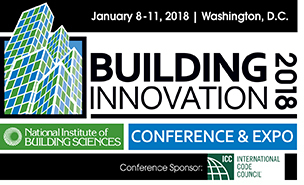 Building Innovation 2018, to be held January 8-11, 2018, at the Mandarin Oriental in Washington, D.C., is the industry’s only all-inclusive Conference where members of the entire building community come together to connect, collaborate and create solutions that benefit the built environment. The Conference Planning Team currently is working to put together the technical program for the event, which will explore strategies to Sustain, Strengthen, Secure. Find out more. Write a paper for a chance to win $2,500! The U.S. Celebration of World Standards Day Planning Committee and the SES – Society for Standards Professionals invite paper submissions for the 2017 World Standards Day Paper Competition. This year’s theme is “Smart Health: Using Intelligent Systems to Improve the Quality and Delivery of Health Care in a More Integrated, Focused Approach.” Cash prizes are awarded for the three best papers submitted. Papers must be submitted before midnight August 11. Winners will be announced and given their awards during the U.S. World Standards Day Dinner, to be held October 19 in Washington, D.C. The National Institute of Building Sciences is a member of the Planning Committee that hosts the U.S. World Standards Day Dinner and Reception. View the competition rules. As required by its founding legislation, the National Institute of Building Sciences compiles an Annual Report that showcases the activities of its councils, committees and projects to improve the built environment in the United States. Organized within four areas—Industry Leadership & Advocacy; Security & Disaster Preparedness; Facility Performance & Sustainability; and Information Resources & Technology—the 2016 report highlights that work. The Institute’s councils and committees each focus on specific areas of expertise; yet, together, they cover an expansive number of building-related topics. In addition, the Consultative Council develops a Moving Forward Report, which includes findings and recommendations about those topics that are of most pressing concern across the building industry. Through their activities, the Institute and its members help to shape the nation’s built environment, using a balanced approach to address some of the most intriguing and perplexing problems to achieve high-performing, resilient buildings and communities. Download The 2016 Annual Report to the President of the United States. Mark Fowler (standing), from the Office of High Performance Building Caucus Co-Chair Peter Welch (D-VT), welcomes attendees to a lunch briefing during High Performance Building Week. 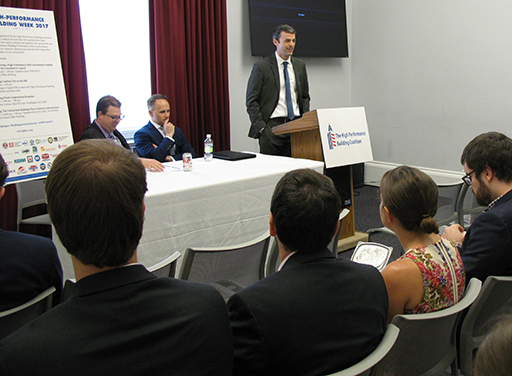 The National Institute of Building Sciences Consultative Council hosted the briefing, “Achieving a High-Performance Built Environment: Findings and Recommendations from the Consultative Council,” on Capitol Hill June 6 to highlight its 2016 Moving Forward Report. Dain Hansen (center), chair of the High Performance Building Coalition, senior vice president of government affairs at the IAPMO Group and member of the Consultative Council, kicked off the presentation. Sara Yerkes (not shown), former chair of the Consultative Council and senior vice president, government relations at the International Code Council, addressed the need for a workforce that can design, construct, operate and regulate high-performance buildings today and into the future. Ryan Colker (left), director of the Consultative Council, discussed the challenges and opportunities around the efficient utilization of water, including water and wastewater infrastructure; premise water; standards for the reuse of water; and the need for research on pipe sizing and human health issues. Read the announcement. Download the Moving Forward Report. 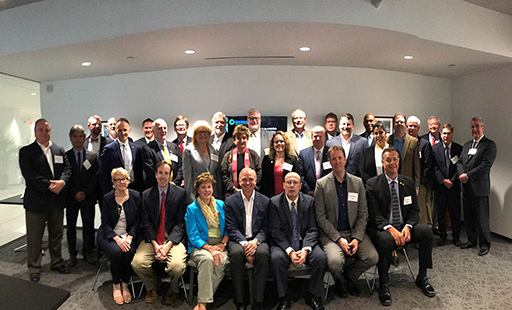 Members of the Plumbing Industry Leaders Council (PILC) convene at the National Institute of Building Sciences May 24. PILC meets annually to discuss mutual issues of concern before the plumbing industry and how organizations can work together to address those challenges. The National Institute of Building Sciences Building Seismic Safety Council (BSSC) will host the fifth webinar in its 2017 series sponsored by the Federal Emergency Management Agency (FEMA). The free webinar, “Design of Seismic Force-Resisting Systems in Wood Light-Frame Buildings,” will be held Friday, July 7, 2017, from 2:00 pm to 3:00 pm ET (11:00 am to 12:00 pm PT). This webinar will provide an introduction to the design of seismic force-resisting systems in wood light-frame buildings, intended to complement the wood design problems in Chapter 14 of FEMA P-1051. Presenter Kelly Cobeen, a member of BSSC’s Provisions Update Committee (PUC) and chair of PUC Issue Team 9: Rigid Wall Flexible Diaphragm and Alternate Provisions for Diaphragm Design, will introduce wood light-frame terminology, design and construction; shear wall concepts and example design calculations; diaphragm concepts and example design calculations; and discuss special seismic provisions for anchorage of concrete and masonry walls. Learn more about the webinar. Register today! Members of the Building Seismic Safety Council will host a session at the upcoming Structural Engineers Association of California (SEAOC) Convention, to be held September 13-15 in San Diego. The session will look at the National Earthquake Hazards Reduction Program (NEHRP) Recommended Seismic Provisions for New Buildings and Other Structures, the resource document that scrutinizes the broadest extent of the seismic design process and provides state-of-knowledge information to improve the current seismic design procedures in the national seismic design standards and model building codes. Supported by the Federal Emergency Management Agency (FEMA), BSSC develops the NEHRP Provisions. Nearly all of the NEHRP Provisions are adopted by American Society of Civil Engineers (ASCE)/Structural Engineering Institute (SEI) ASCE/SEI-7, Minimum Design Loads for Buildings and Other Structures, which in turn is the national standard adopted by the International Building Code (IBC). The presenters will provide an overview of the important issues being considered under the 2020 NEHRP Provisions cycle; highlight several new topics, including the development of the next-generation seismic design value maps; and cover an important code change made in the 2015 cycle. View the session description. Learn more about the NEHRP Provisions. 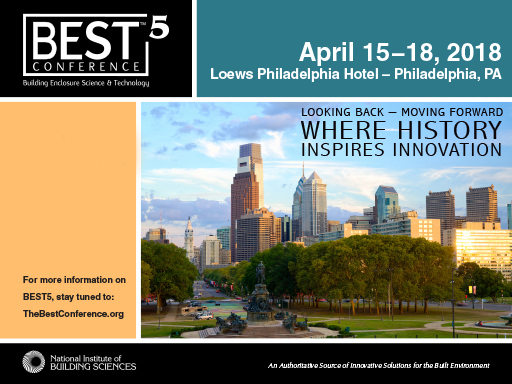 The National Institute of Building Sciences Building Enclosure Technology and Environment Council (BETEC) and the Building Enclosure Council – Philadelphia have moved back the deadline to submit abstracts for papers for presentation at the fifth BEST Conference Building Enclosure Science and Technology™ (BEST5), to be held April 16 – 18, 2018 at the historic Loews Hotel in Philadelphia, Pennsylvania. Abstracts are now due August 1, 2017. From the submissions received, the BEST5 Technical Committee will select approximately 60 abstracts related to building science research, design or practice for conference papers and presentations, panel presentations and poster presentations. Read the announcement. Submit an abstract. Collegiate institutions can start preparing for the next U.S. Department of Energy Race to Zero Student Design Competition, planned for April 2018 at the National Renewable Energy Laboratory in Golden, Colorado. The DOE Race to Zero inspires collegiate students to become the next generation of building science professionals through a design challenge for zero energy ready buildings. Teams can successfully compete with a group of undergraduate or graduate students for one to two semesters. The fifth annual Race to Zero competition will include a commercial building design contest in addition to the residential building contests, giving teams many options of building types as the focus of their design challenge. Learn more about the Race to Zero competition. 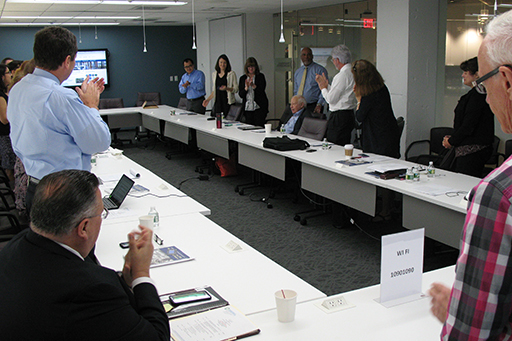 The WBDG Whole Building Design Guide® Board of Direction and members of the National Institute of Building Sciences staff give a standing ovation to Lloyd Siegel, Associate Executive Director, Office of Facilities Planning at the U.S. Department of Veterans Affairs, who is retiring on June 30. Institute President Henry L. Green, Hon. AIA, also presented Siegel with a certificate commending him for his many years of support of WBDG and his long tenure on the WBDG Board. Siegel has served on the WBDG Board of Direction since its inception in the early 2000’s. His support and advocacy for the website has been a significant factor in WBDG’s ongoing growth and recognition as the leading online resource for high-performance buildings. Visit the WBDG. Mariangelica Carrasquillo-Mangual (in red), civil engineer with the U.S. Army Corps of Engineers (USACE) Engineer Research and Development Center (ERDC) Construction Engineering Research Lab (CERL), presents an update on the Army Corps of Engineers accreditation of the ProjNet™ web-based design and construction suite of tools during the annual Government to Business (G2B) Meeting, held June 15 at the National Institute of Building Sciences. The goal of ProjNet™ annual meetings is to provide ProjNet™ users and stakeholders with a recap of the past year’s operation, maintenance and development activities. 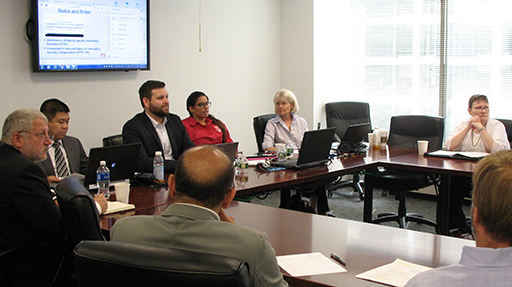 The ProjNet™ operations and maintenance and development team talked about the usage of ProjNet™ applications, status of the Department of State system accreditation, an update on overall functionality upgrades and statistics on call-center support activities. The ProjNet™ team also presented an update on the status of the overall system modernization, which includes a new software architecture, an updated user interface and a flexible account management framework. The Institute manages the ProjNet™ program for ERDC-CERL. Learn more about ProjNet™.